CPC stands for “Cost Per Click”. In this model, you pay a set amount every time your ad is clicked. For example, if you were paying $0.40 per click, and your ad is clicked 1,500 times, you would pay the ad network $600 total for your ad. If fewer people click your ad, you would pay less. CPM stands for “Cost Per Mille”. “Mille” refers to every 1,000 impressions. With this model, you pay a set amount for a network to serve up your ad 1,000 times. This price point is unaffected by whether people click through to your website or not. Each model comes with its own strengths and disadvantages. Depending on what you're marketing, one of these pricing models may be a better bet. Here are just a few reasons why you might choose either option. In a CPC model, you only pay for the ads that people click on. No matter how many times your ad has been seen, you won’t have to pay if they don’t click it. This has a distinct advantage - you’re not paying for advertising that might not be leading to direct sales. For this reason, we use suggest using CPC to drive conversions, whether these are website visits or sales. The main disadvantage of this approach is that if your ad isn’t getting much engagement, it may be shuffled out of the advertising network’s rotation and fewer people might be even seeing it. There isn’t as much incentive for networks to show your ad if people aren’t clicking and they aren’t getting paid. A CPM model guarantees that at least a certain number of people will see your ads. That's why CPM is best used to drive general awareness. It's the way to go when you’re trying to build brand visibility. Then again, if a thousand people see your ad but few click it, it might feel like you’ve spent your money in vain. Networks can use tools to ensure these ads are being shown to an audience whose interests may make them more liable to be interested in your product, which can help prevent this lack of engagement. Which is Best for My Marketing Goals? Which model is right for you depends on your advertising campaign’s goals. 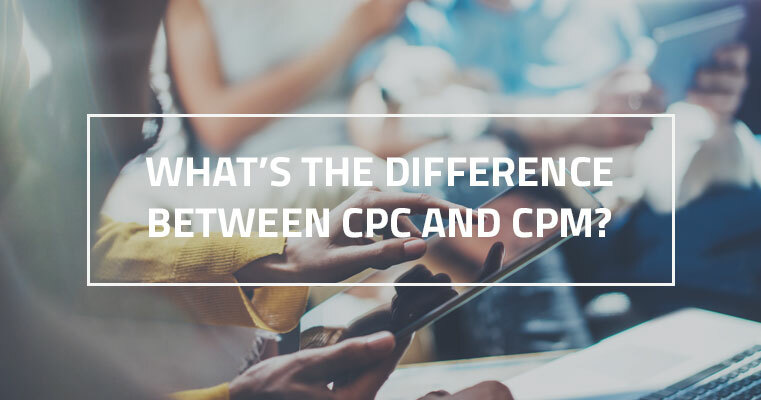 CPC is a good option if your business is an online marketplace or sells products dependent on people clicking through and browsing your website. If what you’re selling is inexpensive or something people could conceivably want to buy on impulse, then CPC could enable you to only pay for those ads that bring direct traffic to your site. However, if the product you’re selling is a $25,000 piece of machinery or a hefty investment, direct traffic may not be as important as having a general awareness of your business among people who would be most interested. With CPM, you’re guaranteed a certain number of ads will be shown to your audience since you’re paying specifically for the number of impressions. If you’re not still not sure which one to choose, Right Idea Media and Creative can help! We’ll work closely with you to determine which digital advertising approach is right for you.